Lettuce can be grown in pots or ground starting from seeds, outdoors or indoors. Learn the growing details of lettuce including its planting, caring and harvesting. 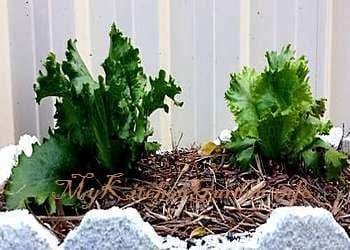 Lettuce (Lactuca sativa) is easy to grow, kids enjoy planting and see it growing so quickly in 6-8 weeks after sowing. Lettuce comes in a variety of sizes, shapes and colors. Its leaves are used in salads, and the stems are used in Chinese cooking. The first thing in how to start a lettuce is to decide on the type of lettuce to plant. 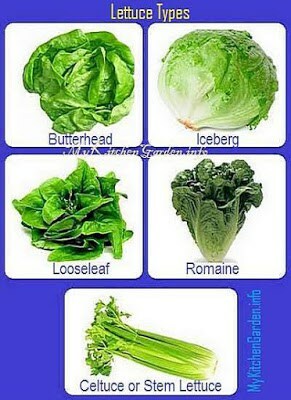 There are various types of lettuce to choose from. The lettuce is classified into five types. This type of lettuce is a smooth, buttery textured sweet-tasting lettuce which forms a compact slightly flat head looking like an open rose. The diameter of a butterhead lettuce can be as large as 15 cm (6 inch) or more. It has crisp leaves which are tightly packed forming a solid spherical compact head, whose outer leaves are dark green and inner greenish white. This lettuce keeps longer than leaf lettuce. It does not form a head, but consists of tight rosettes of individual leaves. The leaves are crisp and buttery-flavored. which can be smooth, curled, ruffled or oak-leaf shaped. The leaf color may be yellow, green, bronze, red or purple. Romaine lettuce has a large head consisting of 20 cm (8 inches) long ribbed narrow leaves which are crisp, tender and sweet. The center of the head is a succulent heart surrounded by greenish-yellow inner leaves which in turn are surrounded by dark green outer leaves. It has a succulent, thick stem which can grow to 25 cm (10 inches) or more having soft green tender leaves at its end. Lettuce grows in cool season of spring and fall in most USDA Hardiness zones 4 to 9 and almost year round in Australia and India. It should be planted when the soil temperature is between 8°C and 27°C. You can sow seeds indoors 4 - 5 weeks before last spring frost date. Lettuce can be grown in garden beds or pots. Lettuce is a great vegetable for container gardening in as shallow trays, 10 cm (4 inch). Plant in part sun. Provide some shade to prevent them bolting to flower in the hot summer. Loose well-drained, sandy loam soil, slightly acidic having a pH around 6 and enriched with organic matter is good for growing lettuce. So break all the chunks of soil. Add river sand to make the soil free-draining and plenty of compost and cow manure to the soil for water retention. It is better to sow the seeds directly in the ground or container, although the seedlings can also be planted. Sow seeds about 1 cm deep in rows or just sprinkle them and water thoroughly. When the seedlings have four leaves, thin out the leaf lettuce to 10 cm (4 inches) apart, and Cos and loose-headed types 20 cm (8 inches) apart. If you have planted the firm-headed type, then keep them about 40 cm (16 inches) apart. Use the thinning as small salad greens. The rows of plants should be 12 to 15 inches across. I sow seeds every two weeks for a continuous harvest throughout the growing season. Lettuce is 90 percent water and has very shallow roots, so keep soil moist but not soggy. Soggy soil can cause bottom rot. I use sugarcane mulch to contain moisture and keep weeds away. As the plants are shallow rooted, take out the weeds carefully. Water daily in hot or dry weather to prevent bitter flavour and bolting. If the leaves are wilting, sprinkle them to cool down. Lettuce prefers a steady supply of nitrogen to keep it growing fast. Use fish emulsion, alfalfa meal or a slow-release fertilizer every third week. Apply compost as a side-dress 2-3 times in the growing season. The pests such as aphids, earwigs, cutworms, white mold and slugs may attack the lettuce plants. Soggy soil and crowded plants can encourage bottom rot, turning the lower leaves grayish green or with dark brown spots and foul-smelling. To prevent diseases, avoid wetting the leaves when you water, water on sunny mornings, so the leaves can dry by evening. Mulch will prevent the leaves to come in contact with the soil, avoiding any disease. Lettuce forms a low rosette of leaves like spinach in early spring, then produces a flower stalk in hot summer when it becomes bitter, so it should be harvested before flowering. Lattuce tastes best when eaten fresh and should be harvested before maturity as matured lettuce gets hard and bitter. The lettuce plants start to elongate and form a bitter sap just before bolting. If this happens, pinch off the top center of the plant. Morning is the best time to harvest before sun strikes the leaves. Harvest leaf lettuce by cutting outer leaves and let the center leaves continue to grow. Crisphead lettuce is removed when the center is firm. You can pick the outer leaves of the Romaine and Butterhead types when required for salad. They can also be harvested by cutting the plant about an inch above the soil surface, they will grow again. If the lettuce gets wilted, put the leaves in icy cold water and soak for 10-15 minutes. The refrigerated lettuce leaves keep good for up to 2 weeks. Do not plant with Celery, Parsley, etc.